I’ve never been a fan of making lofty New Year’s resolutions, but a commitment to decluttering is something I can get behind. With that being said, there’s just something about a clean, organized space that does wonders for your mental health. So, even if you dislike resolutions as much as I do, cleaning your desk is an easy way to start the new year with a fresh, organized space that will help you work more efficiently. Is there such a thing as good stress? While the idea of a clean desk improving your mental state may sound like pseudoscience, there are actual studies that suggest clutter has been linked to depression, anxiety, and elevated stress levels. On the other hand, experts suggest that a clear workspace gives you more focus, peace of mind, and productivity. 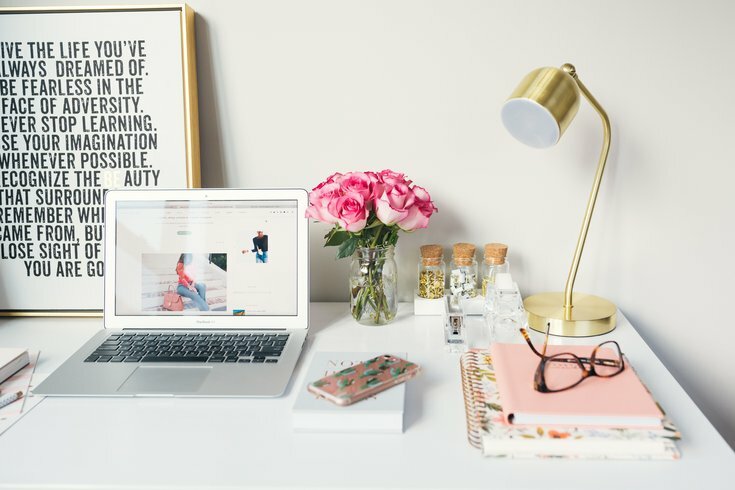 Your desk is the perfect place to start decluttering because you likely spend a good portion of your day there, and it’s probably the easiest space in your life to tackle (leave the attic or basement for another day). So how do you start creating a calming workspace that helps you work more efficiently? Clean. After you clear all items from your desk, wipe down the surface and disinfect all surfaces including your mouse, keyboard, and phone. Be discerning about what stays on your desk. Your desk is your primary workspace and should be conducive to efficiency and creativity. Whatever you decide to put back on your desk needs to have an immediate purpose. If you don’t use it daily, don’t let it occupy space on your desk. You don’t have to create a sparse, impersonal space, but try to limit it to one or two picture frames or personal items. Create an organization system. Reduce the piles of paper on your desk by organizing current projects in labeled file folders and storing them in an incline sorter. Completed projects should be filed away in a cabinet for a short time. Every six months, revisit completed projects and shred or throw out anything that is no longer needed. Maximize your use of physical and digital storage space. Any books, papers, office supplies, food, or other items you don’t use daily can be stored in drawers or on shelves. Reduce paper by storing project documentation or files on a personal drive or server. If you have a copy of something digitally, throw out the paper version. Use the Notes feature on your computer or phone to reduce sticky notes. You could also use a simple dry erase board to organize tasks and priorities. Keep up the habit. Reserve the last five minutes of every work day to quickly tidy up your desk. If you do a little bit every day, you won’t get overwhelmed with clutter and you’ll start the next day fresh and ready to go. The start of a new year is the perfect time to organize your workspace and refresh the space where you spend a good chunk of your day. Creating an uncluttered, organized, and clean desk will help reduce stress and inspire you to be more focused and productive. What better way to start 2019?